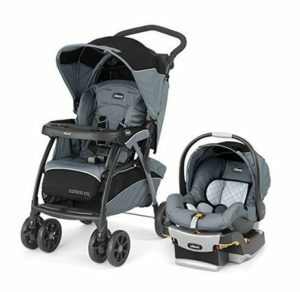 The Chicco Cortina CX Travel system comes with a stroller as well as a car seat for your kid. If you are out in the park, you might need a stroller that carries all the things your child needs. Then, on your way, you can strap your kid in the safety seat for security during the car trip. The item currently is available in two color schemes – Iron and Lava. The CX system can be used as a stroller or as a car seat. You can separate them one from another. The push-chair can accommodate your baby’s things, and the seat is lined with energy-absorbing foam to keep your baby safe always. This travel system has a unique Memory recline feature. That is, the seat remembers your child’s last position as you fold it down. There is all-wheel suspension, and with the one-touch linked rear brakes, you can easily maneuver the pram. Also, there is a shopping basket which is very accessible to you. Make your kid comfortable in the soft seating with the 3-position leg rest and flat recline. To keep away harsh sunlight or rain, the canopy cover is laminated on both sides. The canopy is also reversible so that you can switch to the other side if ever you need to. Also, the front wheels can be locked so that you can rock the pram while waiting in line. You must have tried different car seats and always encounter the problem that he is either too small or too big for it. Well, the Chicco Cortina safety seat is a luxurious accessory that will give you peace of mind while you are behind the steering wheel with your baby beside you. It provides enough room for children up to 30 pounds. The handle is adjustable and is ergonomically designed for your comfort. The seat has a lining of EPS, an energy absorbing sort of foam to provide maximum safety for your baby in case of a traffic accident. Additionally, there is a 5-point harness with a one-hand adjustment as well as a canopy for weather protection. So, the CX from Chicco is the right product for keeping your child safe wherever you go. With the stroller and the car seat, you are provided with safe places to strap your child in when you are out in the park or on a car trip. The Cortina system has earned a lot more good responses from customers than bad. Customer reviews depict this baby stroller to be one of the best of its kind. New parents worrying about finding the right cart for their babies will never have to stress themselves again after using this model. The adjustable handlebar suits the needs of varying heights and reaches. The inside of the cart is spacious enough for big children to fit in comfortably. The front wheels contain a lock that can be activated to keep the pushchair stagnant, disabling it from randomly moving away from one place to another. The seat reclines, and the shoulder straps can be removed to make more space for the baby. However, one crucial flaw lies in this baby cart in the form of heavyweight. While not exceedingly heavy, it still contains quite the weight when compared to other similar strollers.